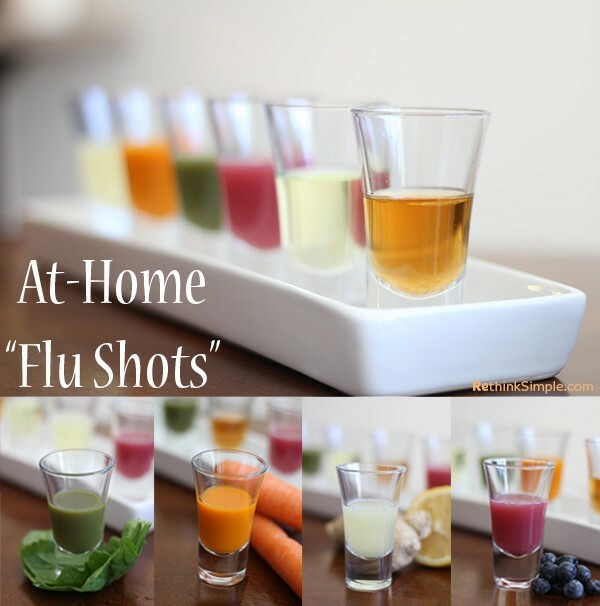 These six shots are made up of real food ingredients that boost your body’s immune system to naturally ward off colds and flus. Some of the below are made with a juicer, although if you want to boost your immune system and do not have a juicer or do not wish to invest in one, you can blend the food up in a blender with water and strain off the pulp using a cotton muslin towel or bag. KISST Organics has both if you woul like to purchse them, the towel are 2 for $5 the straining bag is quart size and is only $3 (preferred). These items are NOT available in our on-line store but are available by calling (308) 254-5373 to place your order. Please have your credit card ready when you call. apple cider. This ‘Slammer’ contains beta-carotene, which according to the Mayo Clinic possesses antioxidant properties that counteract the damage done by free radicals and in return helps boost your immune system [source]. Find organic, raw unfiltered apple cider vinegar for maximum health benefits. KISST Organics carries Bragg's Apple Cider Vinegar. It is available to order by phone. It is not available on our web site. 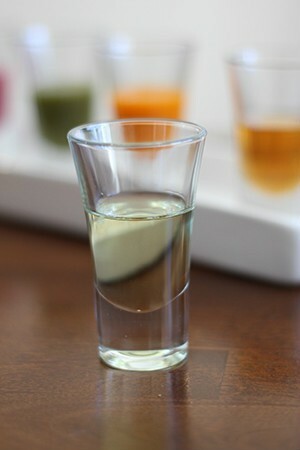 Shot Recipe: Shoot back a tablespoon of apple cider vinegar mixed with a tablespoon of filtered water. Can’t stomach it? I personally suggest mixing a tablespoon with 8 oz of glass of cold water. You can also add a touch of raw honey, if you choose. Green leafy vegetables such as kale, spinach, and parsley provide a significant amount of nutrients including but not limited to, magnesium, folate, and vitamin B6. These crucial nutrients play an important role in optimal immune health [source]. Fermented Cod Liver Oil is a raw, traditionally fermented food. It contains more Vitamin A per unit weight than any other common food and is a great source of the ever important Omega-3 Fatty Acids. This powerhouse real food helps regulate and improve overall function of your immune system [source]. Read more about Fermented Cod Liver Oil here and here. 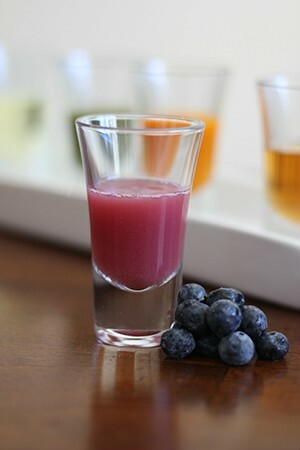 4)“Blueberry Blast”Blueberries are very high in antioxidants compared to other fruits and vegetables and contain powerful phytochemicals which give the fruit their deep blue color. A recent study done by the University of Oregon shared that the pterostilbene found in blueberries, when combined with vitamin D, could boost the body’s ability to fend off illness [source]. Carrots are an great source of beta carotene. One of beta carotene’s main roles is to support the body’s mucus membrane, which lines the respiratory and intestinal tracts. A strong lining makes it more difficult for bacteria to enter the bloodstream and cause you trouble [source]. 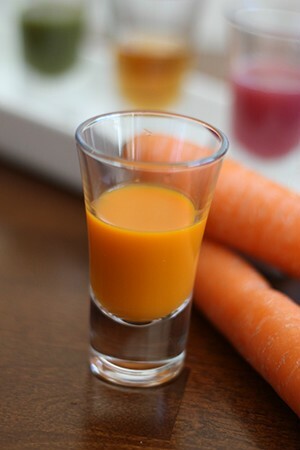 Shot Recipe: Juice a handful of carrots and enjoy. Don’t have a juicer or don't want to strain? Consider incorporating fresh raw carrots into the upcoming weeks menus! Lemon and Ginger are a powerhouse duo. This couple not only supports a strong immune system by the lemon’s Vitamin C content, but together they help fight off an oncoming illness. Lemon juice’s anti-inflammatory qualities soothe sore throats and irritated membranes while the ginger helps cleanse your system [source]. 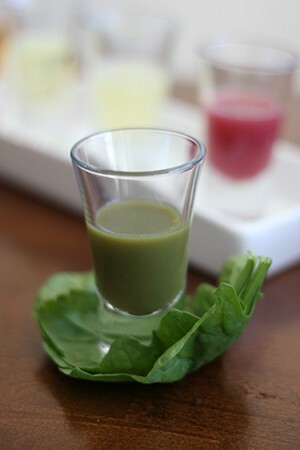 Shot Recipe: Add a tablespoon of freshly squeezed lemon juice to 3 tablespoons of water. Grate or juice a pinch of ginger and enjoy. 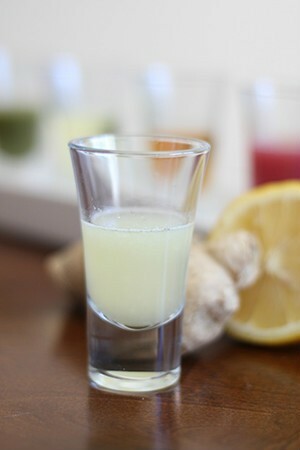 Instead of taking this as a shooter you can also enjoy a glass of home made lemonade and simply add ginger. I take lemon and ginger together in the form of a hot lemonade. Ginger keeps very well long term in the freezer. I grate it, freeze it and then just take out what I am going to use at the time. 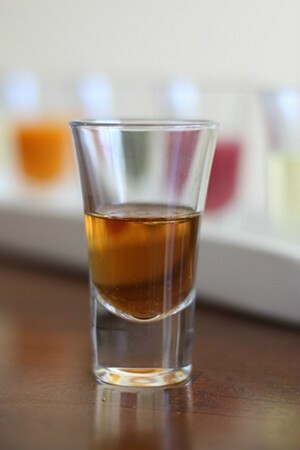 *Dosage: I personally take Apple Cider Vinegar daily, and rotate between these other “flu-shots” throughout the week. As the shots are made up of real food, I take them freely!